Your Mortgage Is Approved! Here's What Happens Next. Thank you for entrusting us with your mortgage. Income assessed. Major documents on file. Finalized. On file. Subject to review of all documents. Any repairs or upgrades needed? 6.Appraisal 7.Conditions submitted 8. Lawyer instructed 9.Final Review 10.Mortgage funded! (Not needed with CMHC) Need to achieve ‘File Complete’. (Some lenders do this early) (Any remaining items?) You are a home owner! At each step, everything often goes very smoothly. Nonetheless, each one can entail; -critical phases, -third parties to deal with, and -deadlines. So any one, or several of these steps, may need an extra level of professional advice and service. We work with you along the way to manage every step to meet our high standards. After Approval (4), we encourage clients to focus on Conditions Submitted (7) to Final Review (9). All mortgage lenders use the term 'File Complete' after these steps are completed. We will work with you to achieve this ASAP! (Here is a little secret that many home buyers are unaware of; -lenders issue the approval first, -but only complete the regulatory verifications (7. Conditions Submitted) after they receive the signed copy of your approval! This takes several days. Then, after this is completed, the process of funding your mortgage (draw down of funds from the bond markets) can also take up to 5 more days! Even these last phases require time, so it is important for us to deal with documentation early! We manage all of these steps from the first contact with you! (i.e. We are thorough with documentation from the very outset.) 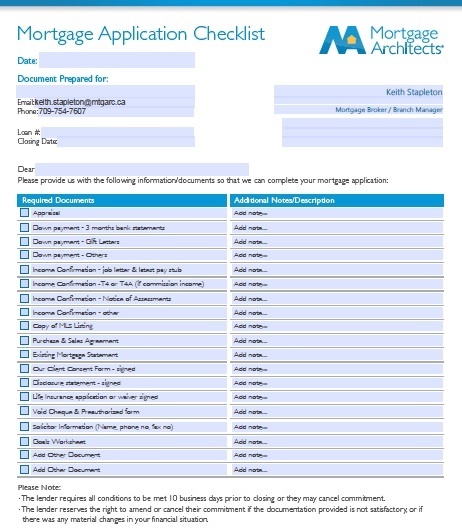 Your Mortgage Application (Documentation) Checklist is your guide to a great head start. Please refer to it throughout the process of finalizing your mortgage. Remember, throughout the whole process we follow high standards. Our goal is to deliver a world-class experience to you! (Mortgage lenders and government regulators also want to provide client care. But to home buyers, their process may not feel like that!) We will update you regularly, throughout every step. Feel free to call us at any time if you have any questions. 1. Notices of Assessment/NOAs from CRA; Do you have copies of your NOAs in hand now? Canada Revenue Agency (CRA) is discontinuing hard copies sent by mail.Getting copies can take a long time if you are not set up on the CRA Online system. Please allow extra time for this. 2. Employment & Income; Do you have copies of current pay stubs and tax returns with all T4s now? Lenders do an in-depth analysis, including a verbal confirmation just days before your mortgage is advanced! Do not assume lenders will accept incomplete or informal information! 3. Down Payment; Can you provide documentation now that shows at least a 90 day record? Lenders must comply with Federal Regulations on this. Down payment, as well as legal fees, must be clearly documented. 4. Equifax; Is your credit report 100% accurate? Reporting errors and surprises are common! From parking tickets and NL Student Loans, to banks not reporting a long-standing credit card with a perfect record, your Equifax report must be obtained and analyzed as soon as possible. 5. Final Review; Can any changes be made after approval? No! Your mortgage approval states that approval can be canceled at any time if there are any material changes. Lenders conduct a final review 24 hours prior to advancing your mortgage to look for this. Here are a few examples of late changes that will lead to cancellation; -a promotion that includes 'probation' or change to 'contractual' -furniture or appliances purchased with 'no payments for 180 days' will still cause the lender to include that payment today! -Gift Down Payment without all supporting bank statements.